If you’re anything like me, you came across the term “Sensory Processing Disorder” as the result of a series of frantic late-night Google searches with a crying baby/toddler in your arms. “Why is my child afraid of *insert name of non-scary sound*? or “Why does getting dressed make my baby scream for an hour?” Maybe you’ve been researching gross motor delays because your baby hasn’t started crawling and it’s way past time. Maybe it was something really scary, like choking after over-stuffing his mouth with food, or getting kicked out of daycare for hitting. Perhaps you’re in the opposite boat, and your child is too afraid to venture out in public, let alone approach another child. Okay, I know what you’re thinking–the problems in this list all seem so different and unrelated, right? Welcome to the murky mire that is Sensory Processing Disorder! Sensory processing disorder, also known as sensory integration dysfunction, is a neurological disorder that affects how the different sensory systems in the body receive information. We’re all familiar with the five senses: taste, touch, sight, hearing, and smell. But did you know that we actually have eight senses?! The three that are new to most of us are our vestibular, proprioceptive, and interoceptive systems. Our vestibular system is responsible for our balance and sense of where we are in space (specifically, the location of our head in space). Proprioception senses the position and location of our muscles and joints. Our interoception helps regulate things like hunger, thirst, and heart rate. It helps tell us what our internal organs are feeling. All of these systems work together in our body to tell us where we are and what we are experiencing. Sensory processing is the process of receiving information from all of these systems. To understand Sensory Processing Disorder, it’s important to understand what normal, healthy sensory processing looks like. Let’s say I decide to eat an orange. Within milliseconds of taking the first bite, my sensory system is sending signals like crazy to my brain. My taste buds are telling my brain “its okay, this taste is ‘Orange,’ we like ‘Orange,’ we have had it before, and there is no reason to fear. You just keep on keepin’ on, Megan–we are safe! This is exactly what my sense of touch told my brain when I picked it up, and my olfactory sense when it smelled ‘Orange.’ This is how a normal, well-functioning sensory system processes sensory information. Under-responsive-Under responsive children might be the babies that were very mellow and ‘easy.’ Nothing seems to phase these children, and they might not even respond to pain. Cold, hot-it’s all the same to these children, as they aren’t receiving sensory information about their surroundings. Over-responsive-Anything and everything can send children who suffer from over-responsivity into a frenzy. Everything is just too much for them and it can be very hard to control emotions. Sensory-seeking- These are the kids that like to play rough. They may often bump into things, smash things, and use an inappropriate amount of force. They may over-stuff their mouth with food because they just want to feel. They crave sensory experiences and need them to feel grounded. When you combine these three different responses with any number of the eight systems misfiring, it isn’t hard to see why all the examples I listed in the beginning can all stem from the same root issue. Sensory processing can look like the shy girl in the corner who is too afraid to touch the glue at craft time, and it can also look like the boy who gets kicked out of daycare for hitting, and would happily smear glue all over himself. While Sensory Processing Disorder is not medically serious, in the sense that it doesn’t directly endanger your child’s life, it can certainly turn a life–even a whole family–upside down. For me, the key to helping my daughter was to research as much as I could about her specific sensory “hot-spots” and do everything in my power to avoid the things I knew would set her off, and basically just try to understand where she was coming from. Even normally functioning people experience sensory discomfort–no one likes the sound of nails on a chalkboard or snuggling up to a cactus (and if you do, you are most likely under-responsive in the areas of hearing and touch!!) Once I learned that this is a neurological issue, and in no way the result of my failing as a parent, I was able to use my energy into helping her cope, and not just getting through the day. Friends, if you take one thing away from this post, I hope it is that!! 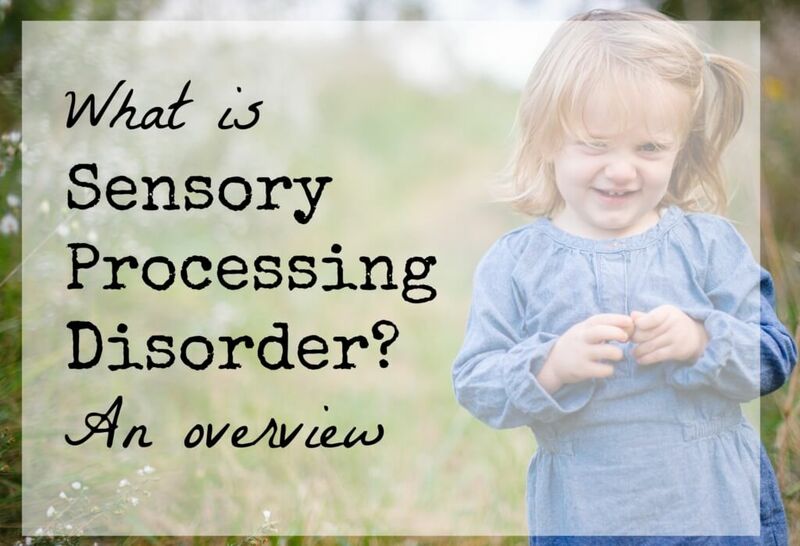 This post is a brief introduction to Sensory Processing Disorder. If you think your child has SPD, or if your child has been diagnosed with SPD, I highly encourage you to read this book: The Out-of-Sync Child . It is absolutely a must read for any parent, and a guide that I found indispensable in understanding my child’s struggles.